Capo again performed well at Master’s and state. Master’s was held at Ontario’s Citizen’s Bank Arena, giving it a “big arena” feel. This added to the drama and excitement. Sophomore Brandon Hernandez, fresh off his runner up performance at CIF, came one match and one point away from qualifying for state. He wrestled incredibly tough, winning his first two matches, before dropping his quarterfinal match to the eventual master’s winner, and dropping his blood round match by 1 point. He then lost his 9th place bracket match 2-0 to a returning state qualifier, eliminating him from the tournament. Brandon has a bright future ahead, and the experience has motivated him to set his sights high and train hard to accomplish great things in this program. Brandon during his second round match. Senior Phillip O’shea placed fourth. He made it to the semis before losing his semi’s match in triple overtime to the #2 seed. He ended up the tournament finishing fourth, winning his consol semis match, then losing his third place match by a 4-3 score. Senior Mike Davis concluded his career at the Master’s tournament. He had a bit of a tough draw, wrestling against very accomplished grapplers in his two matches. Mikey has been a pillar of our program for four years now. It will feel odd not having him on the squad next year. He has accomplished much in his tenure: 3x letterman, 2x cif qualifier, CIF fourth place, team captain. We wish him blessing as he pursues other adventures after high school! Phillip’s turned in an inspiring performance at state, making it to the quarterfinals before being eliminated from the tournament. He won his first match by technical fall, his next match by fall, then upset the #4 ranked wrestler from Clovis, winning by fall, in the third round. This set him up against #3 Clayton Hartwell from James Logan in the quarters. The match was close and intense–3-1. Phillip definitely put up a great fight. He lost his blood round match by a score of 7-3. Phillip’s losses came at the hands of the eventual third and fourth place finishers, and he pinned the eventual 5th place finisher, so he has lots to be proud of. Phillip pinning #4 ranked Matt Weiss of Clovis in the third round of state. He is the first Capo wrestler to make it to the second day of state in at least 10 years. He has made an incredible impact on the program and is one of this school’s most successful wrestlers: 101-30 career record, 47-5 senior year, state top 12, CIF champ, 3x CIF placer (one of only six Capo wrestlers to achieve that feat), 3x South Coast League Champion. His name is all over our record board. Phillip will definitely be missed! You can watch Phillip upset Weiss of Clovis on youtube here. *Capo JV/FS tournament: Juan Pedraza finished first, while Marshall Ferraro, Michael Souri, Juan De La Torre, and Marshall Ferraro finished third. 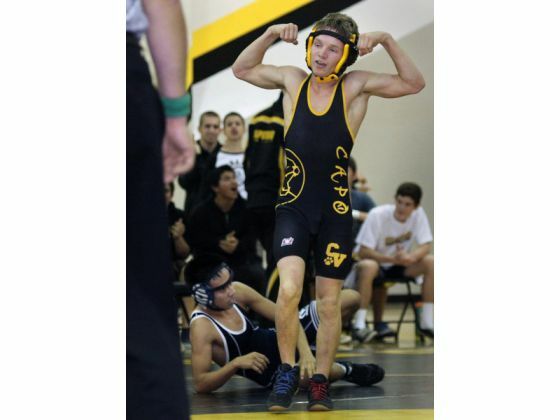 *Capo wrestled Newport Harbor for the alumni dual on Dec 18, and the FS and Varsity teams came away with a win. FS won 37-27, while varsity won 41-29. The varsity jumped out to a 28-0 lead, thanks to pins from Noah Husband, Juan Pedraza, and Michael Davis, and a major decision win from Joey Ahmadzai, before Newport Harbor came storming back. Corey Shackleford got Capo back on track with his exciting 1-0 win, and Phillip O’shea closed out the night with a pin at 220. It was a great night, with many of our alums watching the battle. For all the alums that came out to watch, thank you! On Friday and Saturday, the varsity competed in the 50 team Mann Classic. Capo finished 12th as a team and had four medalists: Brandon Hernandez finished 7th at 120 lbs, Geoff Mellor 5th at 145, Corey Shackleford 8th at 182, and Phillip O’shea 1st at 195. Phillip pinned his way to the finals, then defeated Woodbridge’s Emu Anaim in an intense 5-2 battle. 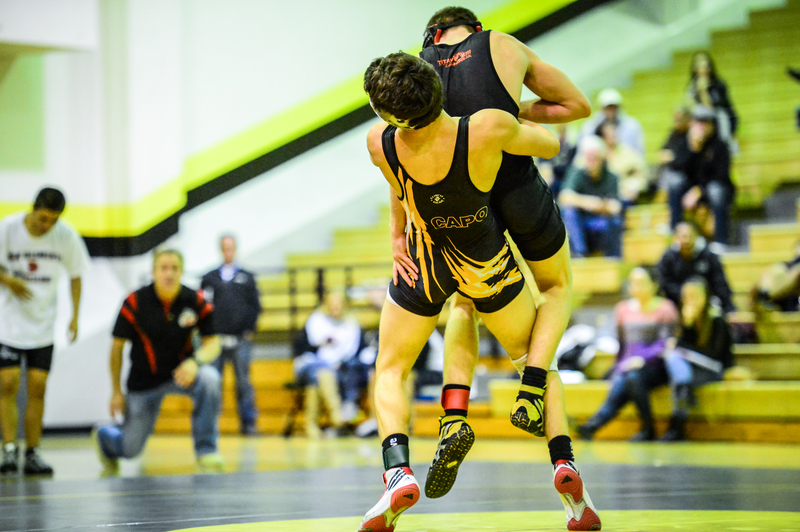 Phillip’s performance earned him the OC Register Wrestler of the Week honors. In addition, Michael Davis received a shout out from the Register too. Capo is in the news! 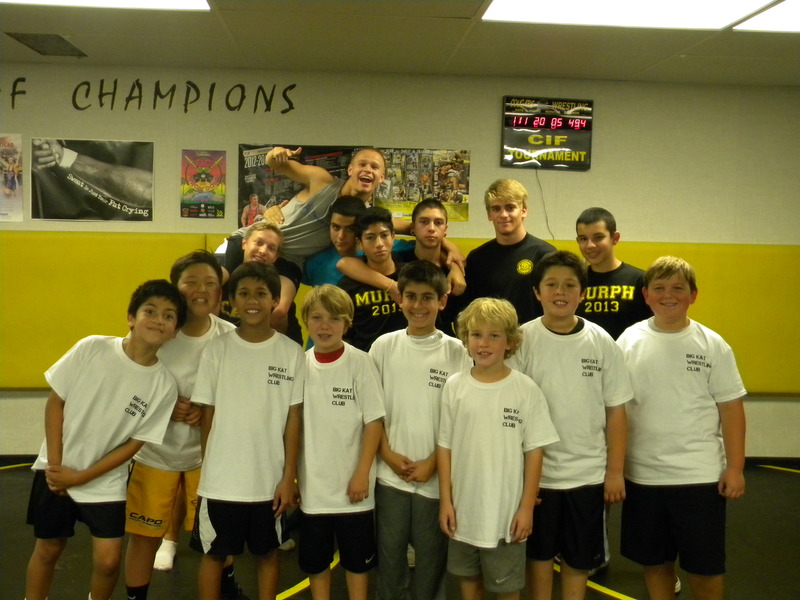 Recently we hosted a youth clinic on Friday Nov 2 for novice wrestlers. All the kids had fun, and got a lot of good, individual attention from the many coaches and counselors in attendance. Below are some pictures. 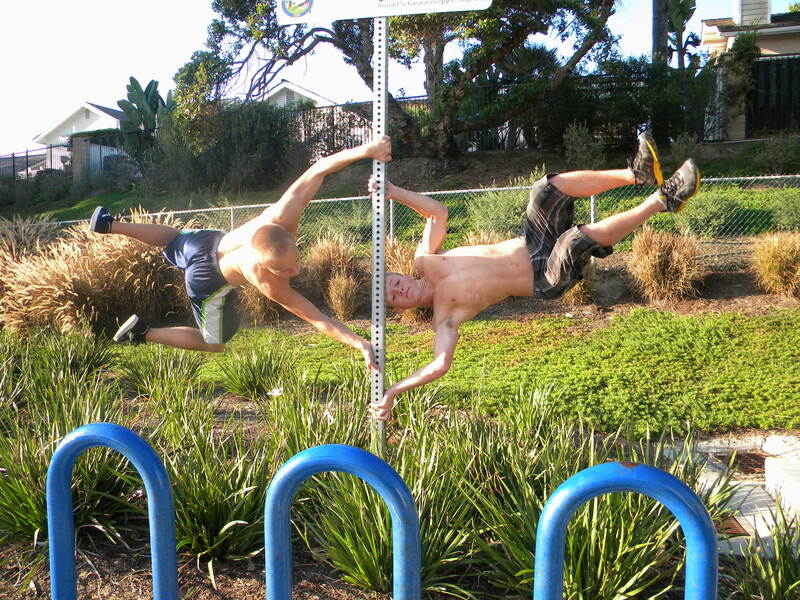 Noah demonstrates a spin behind. Coach Mestakides helps with a front head lock. Geoff and Michael work with some of the youth on a cradle. The campers, along with the afternoon counselor crew. *Summer league: Wrestlers like Corey Shackleford and Michael Youssef scrimmaged with other South County Wrestlers on Tuesday and Thursday nights in June and July. Corey wrestled an astounding 71 matches during the four week summer league, while Michael–who attended every session–wrestled 39 matches. *Summer league finals: Corey and Ian Brault wrestled against So. 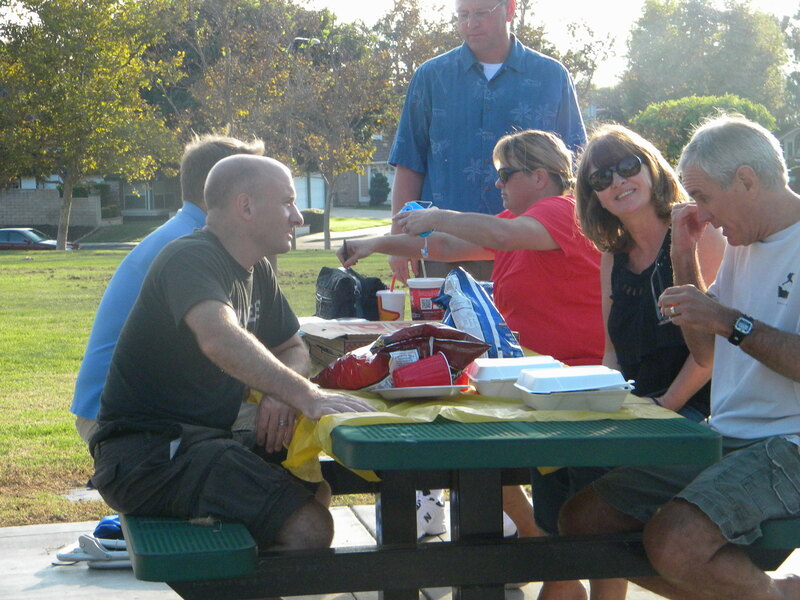 Cal’s best at the Summer league finals tournament at El Dorado on July 20. Some of the top wrestlers from San Diego, OC, La County, and even from Idaho showed up to compete. It was an intense tournament and both gentlemen got good experience. First, Dane Valdez–CA state champion and University of Oklahoma All-American–taught some escapes as counters to various top moves. Valdez sharing his knowledge with the group. Next, Nate Morgan–3x CA state champion from Bakersfield HS and 3x All-American from Oklahoma State University–taught OSU’s low single series, as well as some tricks from a cradle. Nate, sharing a story about the hard work him and his teammate, 2012 Olympic Gold Medalist Jake Varner, put in while they were in high school. Looks like those 3 hr Sat morning practices paid off! Lastly, CA Wrestling Hall of Famer and former Capo teacher and coach Bob Janko pumped the kids up and showed some great moves from neutral. 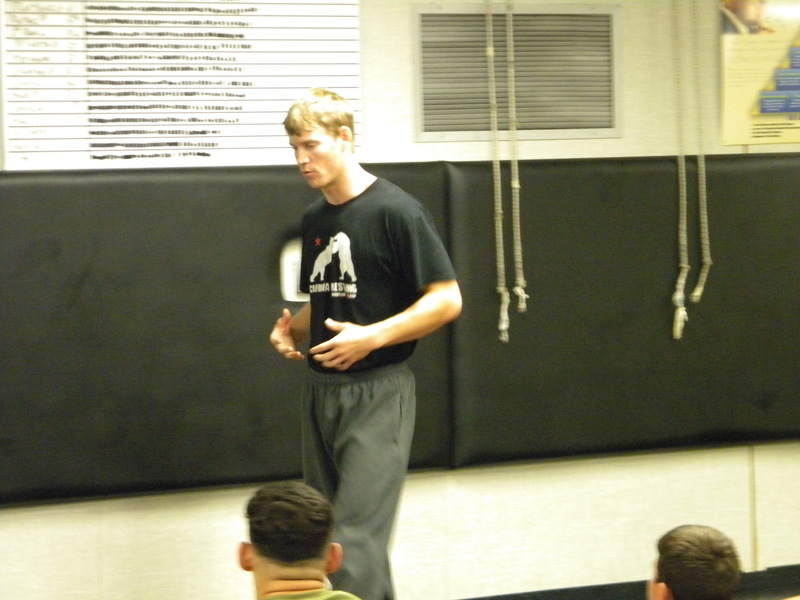 All three clinicians were able to share some psychological perspective with the team, in addition to the moves they showed. The second week circumstances changed and the team didn’t have any clinicians come in, but they still got some good training in and had fun at the same time. The whole time we had some great help from alums Juan Hernandez and Jamey Goddard, as well as new staff coach George Mestakides. The energy was high and everyone had a great time. *Camp of Champs, June 24-27: Brandon, Geoff, Kian, Max, and Matt attended this camp in San Diego. Not only did they receive instruction from 2008 Olympian Andy Hrovat and 2x NCAA champion (and current U. of Wyoming assistant coach) Chris Pendleton, but they wrestled 20 matches against teams from 5 different states: CA, Idaho, New Mexico, Arizona, and Nevada. Max, Geoff, Matt, Brandon, and Kian, with 2008 Olympian Andy Hrovat. Everyone got a lot of good matches in and learned a lot about pushing through tough times. *Ken Chertow’s camp, July 6-10: Calvin and Noah S. attended this camp in Ontario. These guys fought like warriors for 5 days through a very tough camp (Ken Chertow was a 1988 Olympian). Calvin and Noah S, pictured with a few of the Big Kat wrestlers, along with 4x All-American and 3x D1 NCAA finalist Gerry Abas. 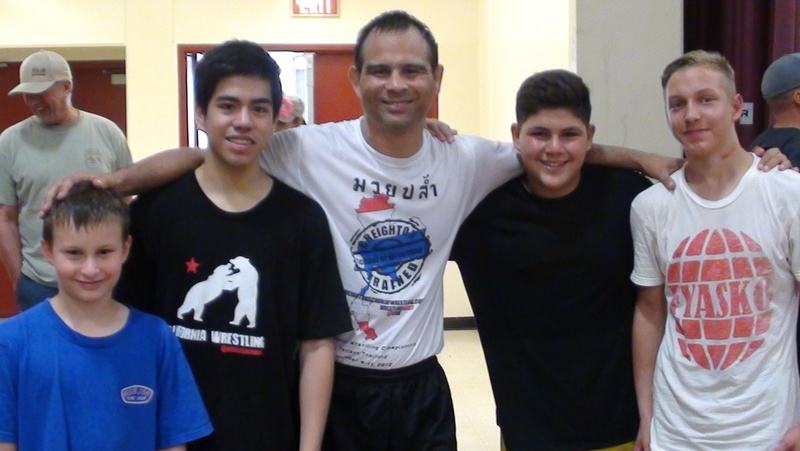 *Currently, Mike Davis and Joey Ahmadzai are at Mark Munoz’s camp in San Diego. Davis is attending the 10 day intensive camp, while Joey is attending the 5 day technique and intensive camp. 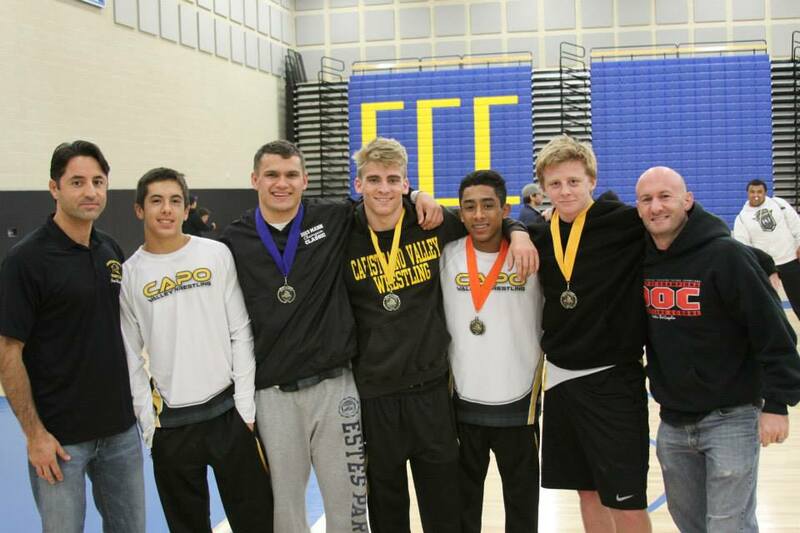 At Capo, we have a points system that measures the amount of off-season work a wrestler does. 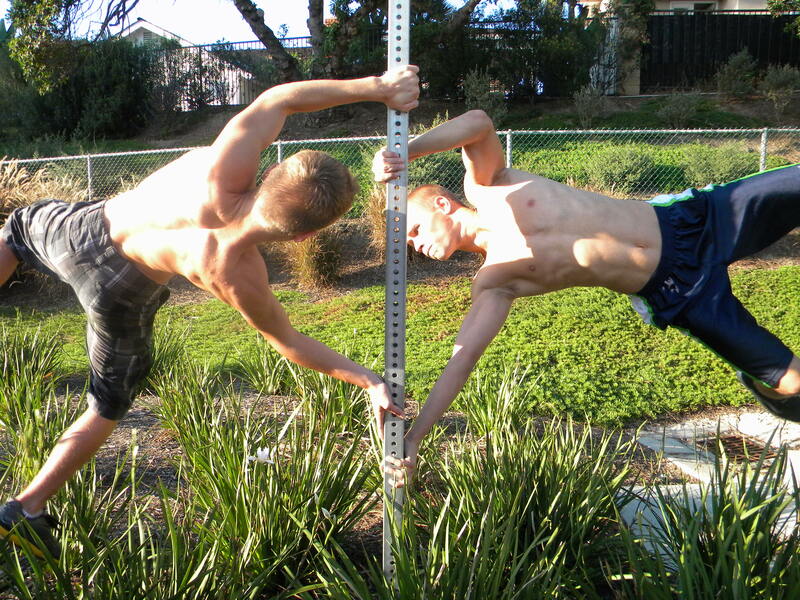 It is simply an objective–rather than subjective–way to measure and gauge the amount of work a wrestler gets. In order to wrestle in the upcoming season, a wrestler needs to obtain 30 points (which isn’t too hard and can be done in a few days, actually), and those who get over 80 earn a spot on our promotional poster for the season. The benefit of it is that it measures mat time *objectively,* no guess work needed when considering how hard a wrestler has worked. We have 14 who have earned their way onto the poster. Last year we had 11. The top points from last year was 191. This year it is 335, set by Corey. So we are moving forward. Yesterday was the first day of our spring season practices, and we had the privilege of having Mark Munoz stop by and help us out a little. Not only did he give the guys some food for thought, but he stayed a while and helped out with technique. Mark is a 2x NCAA champ from Oklahoma State, a current UFC fighter, and owns Reign Training Center, a wrestling and MMA gym in Lake Forest. You guys should check out his place and his summer camp…some of our past greats have greatly benefitted from his instruction. Thanks for stopping by, Mark! 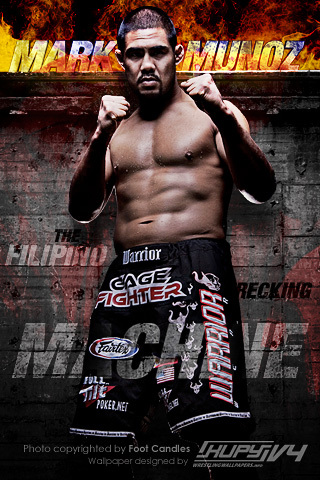 Nice guy off the mat…on the mat and in the cage is another story.